Recently bought a 2011 Dodge Grand Caravan Crew from them. Corey and Ty were so nice, helpful, advised without pressure or guilt, and were very friendly and personable! They were VERY nice and understanding as I tried to navigate car shopping and financing while my husband is thousands of miles away. I'm "stalking" their site, hoping to find a car for my kids, lol! This was hands down the best experience I have ever had buying a used vehicle. Corey went above and beyond to get us the Acadia we wanted and at the payment we wanted. Corey absolutely exceeded our expectations. He was determined and didn’t give up. We visited 3 other Car lots in the past 2 weeks and the other places didn’t take the time to work with us at all but Corey did. Thank you Wholesale Direct Motors! This place is where I will go for now on to buy my new or used car very super friendly don't pressure you to look at this or that they let you fined the car you want and give you the low down on it they don't hide nothing from you it is a Christian ran facility and I was very blessed that I found this place YOU WONT GO NO WHERE ELSE!!! Took my son shopping for his first car. Before being at Wholesale Direct, we met the typical sales people and went through the meet the manager high pressure sales gambit. Wholesale Direct is a completely different experience. We met Ty our sales person and he took time and listened but he never pressured us. He knew his product and he new his prices were set to be a aggressive so he let you figure out if a car on his lot worked for you. After going out and comparing and searching the internet, we came back and purchased my son's car. HIGHLY ENCOURAGE you to at least drive here and take a look if you find a car on their website you want to see! THANKS TY! Now it is Dad's turn to find a car. Everyone here is so nice and very very attentive, I did not feel rushed or pressured to make a decision. Brian and Ty are awesome they kept me informed and updated on where things stood in the process. I drove away in an awesome used vehicle that I can drive many more years, but when I do buy again it will be from these guys. The customer service was excellent. The salesman weren't pushy, but listened to what I was looking for and tried to get me into something I actually wanted that fit my needs without going over my budget. They made buying a car quick, easy, and painless. I would use them again in the future. This was my very first car buying experience and the guys at Wholesale Direct Motors made it a great one. This was my first major purchase out of college, so I appreciated their helpful and friendly service. I would definitely recommend them to anyone looking to purchase a used car. 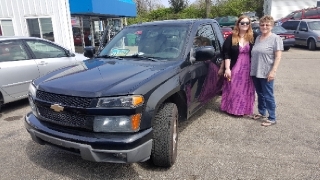 I would like to say that my recent experience purchasing a 2010 Chevrolet Colorado truck from Ty at Wholesale Direct Motors in Beavercreek was a pleasure. It was by far the best car buying experience I have ever had. Ty was patient, knowledgeable, and efficient in every phase of the sales process. He did everything he could to make sure I was happy with my Chevrolet truck. Never at any point did I feel pressured to buy. I can't say enough "good things" about Ty and Wholesale Direct Motors in Beavercreek. I will recommend them to anyone I know wanting to buy a vehicle and I will definitely buy from them again when looking to make another purchase.